Although commonly referred to as flying lemurs, colugos glide rather than fly. In addition, they are in fact not lemurs at all, rendering there name completely misleading. There are two species of colugos, one is The Malayan flying lemur and the other is the Philippines flying lemur. Together these two species make up the Dermoptera order. Colugos are commonly found in Malaysia, Thailand, Singapore, and the Philippines.They are roughly the size of a cat and weigh about 1 – 1.75 kilograms. They are about 36-43cm long with a tail that is anywhere from 22-27cm long and can measure about 70cm across. These dimension gives them a wing loading of about 30 N/m2. 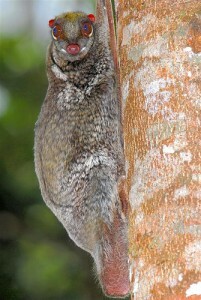 This means that the wing loading of the colugo is similar to that of the Falco Dickinsoni and the Northern flicker. Instead of flying, colugos glide through the forest from one tree to another and can glide as far as 110m on a single jump. They are able to glide because of a thin membrane of skin called a patagium, which is connected to their limbs, their body, and part of their tails. Studies have shown that the colugos uses this membrane to act as a sort of parachute as they descend from trees to a soft landing. Also, they reposition their limbs to absorb the force of the landing which is another way in which they produce softer landings.Colugos can glide as much as two miles per night. On average, the colugos glides about 12 meters horizontally for every vertical meter that it descends. These animals are able to glide around trees and other obstacles because of their ability to make sharp turns mid-glide. Because of this advanced ability to glide and maneuver in the air they were studied by a team at the University of California, Berkeley. Researchers glued motion detectors onto the backs of several colugos and monitored their flight. Greg Byrnes, a member if the study team, explained that “by studying how gliding animals control their membrane, we can learn a lot about how to control flexible wings”. So by researching these creatures it may be possible for engineers to design new types of flexible wings that could be implemented on planes or other flying devices such as hang gliders. Also, the soft fur of these creatures is thought to decrease turbulence which could also be implemented in new technological developments. The colugos is an advanced glider that has nearly perfected the skill. They can glide for long distances in relationship to their vertical height while still maintaing maneuverability. 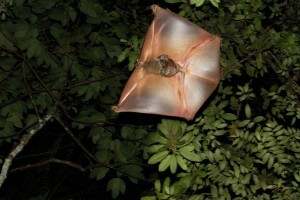 Also, the colugos is able to land softly and glide smoothly through the air with reduced turbulence. Much can learned from these creature which may one day be us full for other types of flight. You quoted PhD student Greg Byrnes, who conducted the field work on colugos with glued-on accelerometers. Byrnes supervisor was Prof. Robert Dudley, our guest speaker next week! As far as I can find, this was reported in the 1977 book “Mammals of Thailand”.